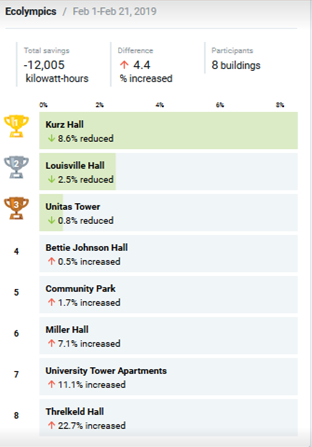 As a part of Ecolympics 2019, Campus Housing and the UofL Sustainability Council hosted a dorm-based energy conservation competition from February 1-21, 2019. Congratulations to the residents of Kurz Hallfor winning their first Gold Medal in Ecolympics!! We will begin planning to reward you with a green renovation. We also want to congratulate our individual weekly winners so far! They all posted their green actions to social media and tagged @UofLsustainable to be entered to win a Comfy Cow ice cream gift card, or Heine Bros. coffee gift-pack, and possibly the grand prize: a restored vintage Peugeot road bike! Rachel McDonald, who skips wasteful bottled water and refills with “liquid gold” Louisville Tap. Sydney Hancock, a GRASS member who was eagerly preparing for the February 22nd rally for climate justice at UofL. Sarah Drerup, UofL's new STEM Librarian who enjoys her campus coffee with a reusable mug and a discount. Join in the fun and you could win, too! It's simple! Post your sustainable actions and tag @UofLSustainable to be entered to win a restored vintage Peugeot road bike, gift cards to Comfy Cow, or Heine Bros. coffee! Shut off lights, TVs, projectors, computers, and other equipment that doesn't really need to on. Unplug a refrigerator you're not really using (consolidate items from several fridges into one! ), TVs, game consoles, cell phone and laptop chargers, or any other devices not really in use. Many devices consume energy even when they are not turned on! Buy locally-made products and support small local businesses rather than shipping your dollars off to mega corporations. Take the stairs instead of energy hogging elevators and escalators. Carpool, bike, walk, or bus instead of driving. Air-dry your laundry on a clothesline or rack instead of using that energy hogging clothes dryer. Take shorter showers or enjoy a guilt-free shower with solar power at the SRC. Reduce, Reuse, Recycle & Compost. REDUCE & RECYCLE! Help the Cards to victory by avoiding disposables (bring your own mug, bottle, plate, etc.) and fully utilizing UofL’s amazingly easy, single-stream recycling system that lets you recycle everything in the same bin, everywhere on campus: all types of plastic, paper, cardboard, metal, and glass! Details on what you can recycle at UofL here. COMPOST! We will be collecting food wastes for composting from The Ville Grill and other campus dining locations and adding those numbers to UofL's organics recycling totals! You can also compost your food scraps and soiled paper products in the compost bins at the Garden Commons (next to the greenhouse behind the Cultural Center) and the Urban & Public Affairs Horticulture Zone. Please no animal/dairy products or liquids, but otherwise, if it came from a plant, we want to compost it: fruit & vegetable wastes/peels/rinds/seeds, bread, pasta, rice, tea bags, coffee grounds/filters, even paper products (tissues, towels, napkins, plates, cups, newspaper, etc.). UofL is offering a collection of electronic wastes for recycling in every residence hall's lobby throughout Ecolympics 2019! You can recycle any electronic consumer items, including: all computers, monitors, televisions, printers, copiers, scanners, servers, networking equipment, fax machines, telephones and cellphones, RAM/memory, hard drives, battery backups, and peripherals such as keyboards, mice, speakers, AC adapters, and mixed computer cables/wires. Please make sure your data has been wiped from your device before recycling. We will also have collections for recycling any type of battery, lamps, and ink/toner cartridges.